Social Security’s projected actuarial deficit over the next 75 years has shrunk from last year’s projection – from 2.84% to 2.78%. The program’s $6.7 billion in administrative costs was a “very low” 0.7 of total expenditures. The combined Trust Fund asset reserves earned an effective annual interest of 2.9% in 2018. The National Committee endorses Rep. John Larson’s Social Security 2100 Act and Senator Bernie Sanders’ Social Security Expansion Act. Both bills ask the wealthy to pay their fair share to strengthen Social Security, something overwhelming majorities of the American people support in poll after poll. The Trustees of the Medicare program report that the federal senior health care program’s finances look about the same as they did in 2018. Medicare’s Part A trust fund will become depleted in 2026, at which time the system still could pay 89% of benefits. But, again, this is only if Congress takes no action to bolster Medicare’s finances. From the very beginning, the segment was couched in a false sense of alarm – with a serious lack of context. Ruhle gravely summarized the Social Security Trustees’ analysis that the system will run out of reserves in 2034 (but only if Congress were to do NOTHING to address the shortfall in advance), accompanied by an on-screen banner reading SOCIAL SECURITY IN PERIL. This framing started off a largely fact-free segment on a disingenuous note that colored the rest of the commentary: Social Security is in trouble. But college kids can come up with a bipartisan solution to save the day! Ruhle: For the first time in Social Security’s history, costs exceeded income in 2018. This is a big deal. And as more people retire, the program seems to be at even greater risk. Reality: Ruhle neglected to mention that there is a Social Security trust fund with $3 trillion in assets which provides the system a fiscal cushion. Even if Congress takes no action to address the projected depletion of the trust fund in 2034, Social Security still would be able to pay 79% of benefits. Social Security itself is not “at risk,” because workers will continue to pay into the system. Ruhle: Politicians don’t want to talk about Social Security. Reality: Politicians in both parties talk about Social Security all the time. Republicans want to cut benefits to pay for the Trump/GOP tax cuts. Democrats are proposing common sense legislation to boost benefits and keep the system solvent for the rest of the century. Ruhle may want to check out Rep. John Larson’s Social Security 2100 Act and Bernie Sanders’ Social Security Expansion Act. 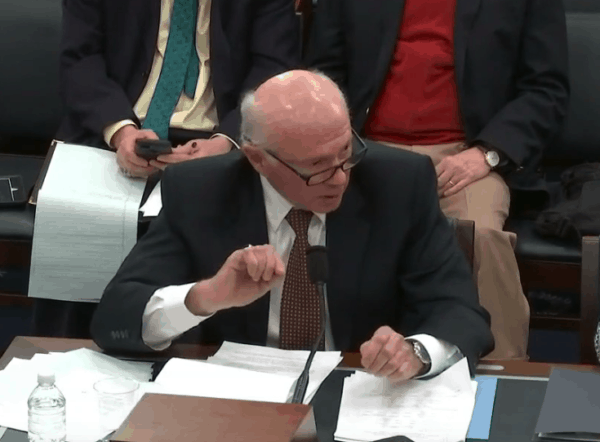 Congressman Larson just chaired his fourth public hearing on Social Security’s future since January. Politicians were definitely talking in that hearing room. Was Ruhle listening? Ruhle: None of the Democratic candidates have a solution to Social Security. Reality: Most of the Democratic candidates running or likely to run for President in 2020 have already come out in favor of Social Security expansion, including Elizabeth Warren, Kamala Harris, Kirsten Gillibrand, Cory Booker, and Beto O’Rourke. In fact, Harris, Booker, and Gillibrand are cosponsors of Sanders’ bill. Ruhle: We don’t hear Washington talking about a solution. The segment then devolved into a largely bogus discussion of how college students don’t think Social Security is going to be there for them when they retire. Or, as Gary Cohn interpreted it, “They’re going to pay in, but they’re not going to collect.” As our president, Max Richtman, pointed out at one of Rep. Larson’s hearings, the main reason younger Americans may feel that way is the constant flood of “disinformation” from conservative circles. The entire MSNBC segment played into the tactic of “entitlement reformers” to bust the generational contract that has helped keep seniors out of poverty for 83 years. No doubt, there is a legitimate ongoing debate about Social Security’s future, and there’s no reason college kids – who will some day collect benefits – shouldn’t be part of it. But debate about something as crucial as Americans’ earned benefits must be based on facts and conducted in context. For a network that prides itself on being factual, them’s the Ruhles. Now that the Democrats have control of the U.S. House, Congress is actually holding hearings (under regular order, no less) on boosting Social Security – a topic the GOP-majority House eschewed. Congressman John Larson (D-CT) chaired a hearing of the House Social Security subcommittee Wednesday that made plain the stakes for current and future seniors – and the fundamental disagreement between the two parties about Social Security’s future. National Committee president Max Richtman joined a panel of witnesses including Diane Stone, director of the Newington, CT senior center from Rep. Larson’s home district; Shaun Castle, a veteran and Deputy Executive Director of Paralyzed Veterans of America; Steven Goss, Chief Actuary of the Social Security program; and Nancy Altman, President of Social Security Works. Witnesses raised real-life examples of seniors living in the grey zone between true “economic security and poverty” who would be better off under Rep. Larson’s Social Security 2100 Act. Richtman recognized Nettie Hailes, a National Committee volunteer in the audience who turned 91 on the day of the hearing. Hailes, whose husband was a Baptist pastor who helped organize Martin Luther King’s March on Washington, depends on Social Security for her income. Richtman said that the 2% across-the-board benefit increase in Congressman Larson’ bill, while modest, could make a big difference for seniors like Nettie. A two-percent boost would equal about $300 annually for the average retiree. So would the improved cost-of-living (COLA) formula in Larson’s legislation – the Consumer Price Index for the Elderly (CPI-E), to help Nettie and other seniors keep pace with inflation. Congressman Larson proposes to pay for enhanced Social Security benefits by adjusting the payroll tax income cap so that earners making more than $400,000 per year would still contribute to Social Security like everyone else – and by raising payroll taxes by 1.2% over 24 years (the equivalent of 50 cents more per week for the average worker). Democrats reminded Republicans that seniors cannot afford benefit cuts now or in the future, especially with employer-provided pensions disappearing and at least half of Americans not earning enough to save for retirement. House Social Security subcommittee Democrats: We can afford to give seniors a benefit boost. As Richtman pointed out during an exchange with Rep. Dan Kildee (D-MI), boosting Social Security benefits helps not only seniors – but the entire economy. REP. KILDEE: Do social security beneficiaries put their earnings away for the future – or do they spend that money? MAX RICHTMAN: The spend it and the money goes right into back into the economy. There’s a multiplier effect. Every dollar spent produces two dollars in economic stimulus. REP. KILDEE: So, if we were to increase [benefits], that increase is going to go right back into the American economy and have a stimulus effect. Richtman testified that Larson’s legislation should help “put to rest” the “steady drumbeat of disinformation” from conservatives that Social Security is “going bankrupt” or won’t be around for future generations. “It will show clearly the program is sound and will be there for the rest of the century,” he said. National Equal Pay Day 2019 reminds us that gender pay equity is crucial not only for social justice, but for women’s retirement security. When women earn less than men (currently, only 80 cents on the dollar), they cannot afford to save sufficient money for retirement – and their Social Security benefits are lower. Women take more time off work to care for family members, but don’t get credit for it in their Social Security earnings history. On average, women outlive men by five years – forcing them to stretch their retirement dollars over a longer span of time. That’s one reason why 11% of senior women live in poverty – an unacceptable number in the wealthiest country on earth. Equal Pay Day marks the calendar date when the average woman has earned as much as the average man did the previous year. According to the National Partnership for Women and Families, African-American women make 64 cents on the dollar of what non-Hispanic white men earn. The figure drops to 55 cents on the dollar for Latinas. Not surprisingly, average Social Security benefits for black women are 25% lower than men’s, while Latinas’ are 31% lower. Though the gender pay gap has closed by 3 percentage points since 2012, America has a long way to go toward wage equality. Among industrialized nations, the country’s pay inequity level consistently ranks in the top five. The wage gap is attributable to various forms of gender discrimination – ranging from biases about women’s performance in the workplace to the fact that men are likely to hold higher-ranking, higher paying positions. Given that society has made scant headway on this issue in recent years, it’s clear that women need stronger federal protections against wage inequality. The National Committee to Preserve Social Security and Medicare fully endorses the Paycheck Fairness Act, introduced by Senator Patty Murray (D-WA) and Rep. Rosa DeLauro (D-CT). Among other things, it would put an end to pay secrecy, strengthen workers’ ability to challenge discrimination, and bring equal pay law into line with other civil rights laws. For more information on pay inequality and women’s retirement security, visit Eleanor’s Hope.